In volume one of the Legends and Stories around the Japanese Sword I mentioned that the Maeda family (前田) preserved in a special treasury the famous Ōtenta-Mitsuyo (大典太光世), a sword by Munechika (宗近), and a naginata of the Shizu school. In this chapter I would like to elaborate briefly on the noted theory that the entry “shizu no naginata” (静の薙刀) in the Maeda chronicles does not refer to the Shizu school (志津), but to the name Shizuka-gozen (静御前). Generally, there were two basic shapes of naginata, namely the shizuka (静) and the tomoe (巴) shape. The names go back to famous female figures, namely to Shizuka-gozen (静御前, 1165-1211), the favourite concubine of Minamoto no Yoshitsune (源義経, 1159-1189) and to Tomoe-gozen (巴御前, 1157~1247), a female warrior and also a concubine of Kiso no Yoshinaka (木曾義仲, 1154-1184). The shizuka shape is not very curved and does not broaden that noticeably to the tip. The tomoe shape is what I might call its counterpart. It shows a pronounced sori and a broadening tip area (see picture below). Today there are more naginata in tomoe shape extant which led to the theory that it developed from the earlier shizuka shape. But old pictorial chronicles show us that the tomoe shape was also used in earlier years. 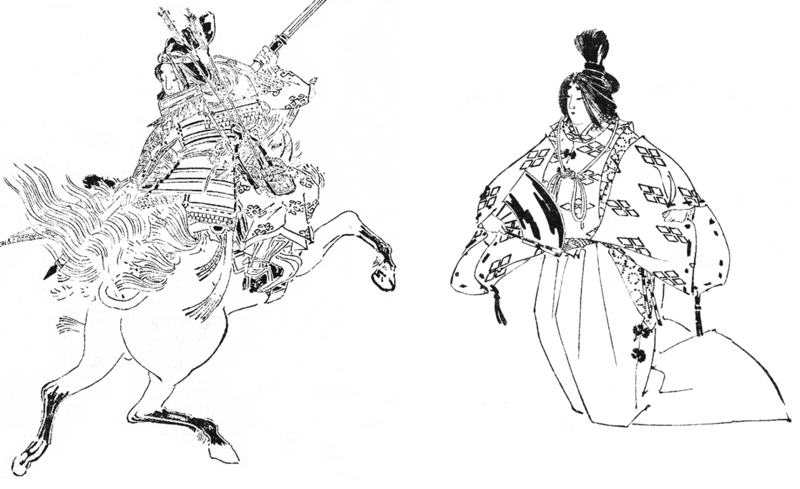 Tomoe-gozen was, as mentioned, an infamous female warrior and beauty who managed to become a bodyguard of Yoshinaka. But it was common for Heian and Kamakura period wives of bushi to be trained in the use of the naginata because they were supposed to defend their home when their husbands were on campaign. So it is somewhat surprising that there are two naginata extant from the possessions of the more “peaceful” Shizua-gozen and not a single one from Tomoe-gozen. Tomoe-gozen (left) and Shizuka-gozen (right) from Kikuchi Yōsai´s Zenken Kojitsu. One of the two mentioned naginata of Shizuka-gozen was once owned by the Tokugawa family. One winter day the third Tokugawa-shōgun Iemitsu (徳川家光, 1604-1651), who was always ready for a joke, took this naginata and crept up to the pond in the garden in front of his residence. His aim was to kill a wild goose with the naginata and so he jumped out of the thicket to go for the bird. But as he was bringing the naginata to the starting position for a blow, he realized that something was wrong with the weapon. After a quick inspection he discovered to his horror that the tang had broken inside the shaft! Of course, the tang of a naginata is considerably longer than that of a sword and so is a little bit more fragile, but this should not happen to a famous masterwork by Munechika. Angry and annoyed he reported this incident to his elder and close friend Hotta Masamori (堀田正盛, 1609-1651): “Imagine. The tang of my heirloom, the naginata from the possessions of Shizuka-gozen broke whilst I was hunting wild geese! I would really like to sell it to an ironmonger…” “Milord, you were lucky, it could have been a lot worse. What if this happened on the battlefield! But a good swordsmith can surely repair the broken tang,” advised Masamori. So Iemitsu´s servant was sent with the piece – or rather with the two pieces – to master Heki Ippō (日置一法), who performed not only an excellent and barely noticeable repair but also made some copies on order of a not specifically mentioned Tokugawa retainer. Let us now turn to the second naginata from the supposed possession of Shizuka-gozen, namely to the one which was later owned by the Maeda family. It had been a heirloom of the Tokugawa family before being sent as a dowry to Maeda Toshitsune (前田利常, 1594-1658) who, for political reasons, was married to Tokugawa Hidetada´s (徳川秀忠, 1579-1632) daughter Tamahime (珠姫) after the Battle of Sekigahara. By the way, Hon´ami Kōho (本阿弥光甫, 1601-1682) was given the order for a new saya. Kōho was the grandson of Kōetsu and worked like the latter for the Maeda family. In the course of the work he asked his employer if he was allowed to keep the old scabbard as an object of study and as a souvenir. The Maeda had no objections to his request. But shortly later a mysterious infectious disease circulated in the Kaga fief (加賀藩) and also affected some members of the Hon´ami family. The physician ordered the sick to remain in bed, but this and the decoction he made for them did not help. Thus a Hon´ami brought up the old saya of the Shizuka-gozen naginata. As Munechika blades were supposed to have magical powers, some of them must also have taken hold of the scabbard too. So the piece was handed from one bedridden patient to the other and, lo and behold, they recovered, probably through autosuggestion. It was also mentioned that another Munechika sword was stored in the karasu-tomarazu no kura. This was a kodachi with a nagasa of 45,45 cm, once in the possession of Maeda Toshitsune´s older sister Gō (豪, 1574-1634) who was married to Ukita Hideie (宇喜多秀家, 1572-1655). She had received the blade from her adoptive father Toyotomi Hideyoshi. Hideie was on the side of the Toyotomi at Sekigahara and withdrew to Satsuma after the defeat. He was caught but through Gō´s mediation the death penalty was turned into banishment to the island of Hachijō(八丈島). *3 Gō was left in the care of the Maeda family and took with her the Munechika sword. She presented it to a Korean immigrant and retainer of the Kaga fief called Sakyō (左京). Sakyō´s adopted son and heir Yōshuku (養叔) was in turn the younger brother of the court physician of the Maeda. Yōshuku, who was a physician too, presented the sword to his lord Maeda Tsunanori because he said he had no use for it as a general practitioner. So the Ōtenta-Mitsuyo, the naginata of Shizuka-gozen and the kodachi by Munechika were unified under Tsunanori and became one of the most treasured heirlooms of the Maeda family. *1 Another version of this anecdote says that he did not use a naginata but a wakizashi and did not attack a falcon but a wild goose. Thereupon he gave the sword the nickname Gankiri (雁切り, lit. “geese cutter”). The specific blade is a work of the Chikushū smith Yasuyoshi (安吉) which later became a heirloom of the Sakakibara family (榊原). *2 As in most other parts of the world, women in their period were regarded as impure in Japan and prevented from participating in ritual actions and or be near consecrated objects. *3 Hachijō Island served the bakufu throughout the entire Edo period as a place of exile for criminals from Eastern Japan. It is located about 287 km to the south Tōkyō.